When it was opened on February 11th, 1933 as part of the new Independent Subway System, the High St. station on today’s A and C lines, the first or last station in Brooklyn, was indeed located on High St. When the east-west street was laid out in the 1820s it ran continuously from Fulton St., which wound circuitously to the Fulton Ferry on the East River, east to Navy Street, which bordered on the Brooklyn Navy Yard. However, no east-west street in downtown Brooklyn has been sacrificed to real estate and transit concerns more than High St. Its first interruption came in the mid-1900s, the 20th Century’s first decade, when a section between Jay and Bridge Sts. was de-mapped and became part of the Brooklyn plaza of the Manhattan Bridge. In the 1940s and 1950s, all of High St. between Bridge and Navy Streets came off the map, demolished to make way for the Brooklyn-Queens Expressway and the Farragut Houses. Today, only one block of High St. remains between Pearl and Jay. Toward its western end, High St. served as a terminus for el trains traveling to and from Manhattan via the Brooklyn Bridge at the massive Sands St. terminal shed. In the 1930s, a large park was under construction between Fulton and Washington, taking out High St.’s western end. Downtown Brooklyn changed, and Fulton St. lost much of its old personality, when entire blocks just east of it were razed between 1950 and 1960 to make way for Samuel Parkes Cadman Plaza, which served to add a lot of green to downtown Brooklyn, which was, admittedly, needed. (The el had already come down in the early 1940s). Samuel Parkes Cadman (1864-1936) was a Methodist minister and leader of the Central Congregational Church in Brooklyn from 1901 until his death. It was Rev. Cadman who called the Woolworth Building in Manhattan the “Cathedral of Commerce.” Cadman Plaza provides views of the Manhattan Bridge from the steps of Borough Hall and allows a vista looking toward the beautiful US Post Office Building on Tillary St., which was much harder to see before the blocks had been cleared out. Perhaps inspired by Cadman Plaza, Boston scuttled its old seedy Scollay Square in favor of the new Government Center in the early-1960s. There’s a forced stillness about Cadman Plaza; it’s like a plot of green that’s been plopped into a neighborhood that didn’t ask for it. The construction of Cadman Plaza caused Fulton St. to be renamed as Cadman Plaza West from the ferry landing to Court and Montague Sts. 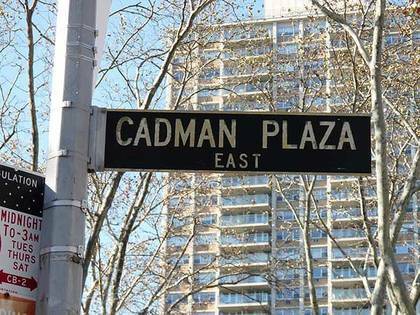 Washington St., on the eastern end, was re-named Cadman Plaza East. Calling Fulton St. Cadman Plaza West from the old ferry landing southeast to the Brooklyn-Queens expressway made no sense, because Cadman Plaza extends from Borough Hall only as far north as the BQE. The city recognized this anomaly in the late-1970s and re-re-named that section of Fulton St. as Old Fulton St. 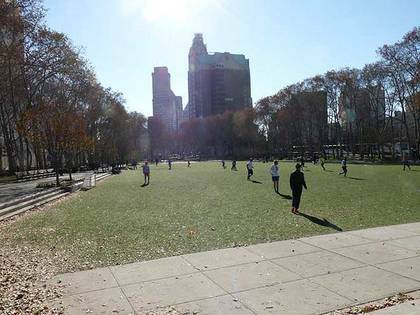 The soccer pitch seen here is the most “parklike” section of Cadman Plaza, and sits just south of one of the plaza’s major memorial works: The Brooklyn War Memorial. This is a massive, granite and limestone monument dedicated to World War II casualties designed by Stuart Constable, Gilmore D. Clarke and W. Earle Andrews, with allegorical depictions of family and bravery by sculptor Charles Keck, who passed away the same year they were unveiled, in 1951. It was part of a five-borough plan by Parks Commissioner Robert Moses to construct five WWII monuments in each borough, but only Brooklyn’s was completed. 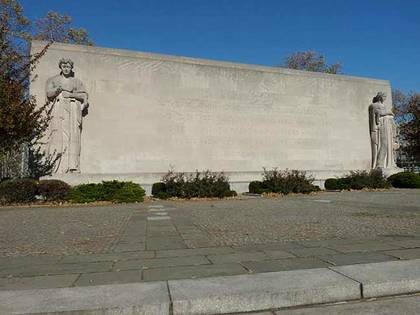 Brooklyn’s war memorial was originally planned to be even more massive, with a central auditorium flanked by two wings, but was scaled down for material and money shortages. The real artifact, though, isn’t the memorial itself but what’s under it. Today the memorial contains administration offices and rest rooms in the basement. And there’s something else of interest. Adjacent to the men’s room, there’s a pay phone, but it’s not just any pay phone. This specimen is so old it still has a 212 area code on its dial, and an affixed Bell Atlantic logo. 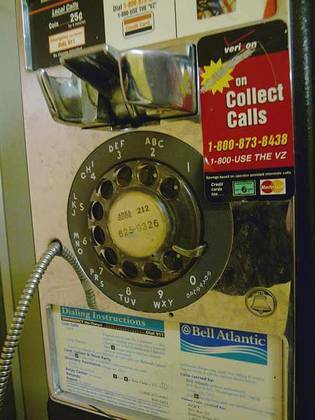 Bell Atlantic existed between 1984, when it was formed after the breakup of the AT&T/Bell system monopoly, and 2000, when it merged with GTE to become Verizon. Rotary dial phones have been in existence since 1892, when an undertaker named Almon Brown Strowger obtained a patent for the dial. However, the rotary dial didn’t assume its present shape until a variety with holes for fingers was introduced in 1904 and saw widespread distribution in 1919. The dial was phased out beginning in the 1960s when pushbutton dialing was introduced. The first TouchTone phone appeared at the Seattle World’s Fair in 1962. East of the memorial on Cadman Plaza East, there’s a relatively new park dedicated to Walt Whitman. Best known for Leaves of Grass, as well as the poems “Crossing Brooklyn Ferry” and “I Sing The Body Electric,” Whitman was born in West Hills, Long Island, in 1819. The young Walt worked as a typesetter and pressman in the 1830s for a couple of Brooklyn newspapers. After trying his hand at fiction in the 1830s, he took over as editor of the Brooklyn Eagle in 1846, a post he’d keep until 1848, leaving in a dispute over abolition (Whitman was anti-slavery, Eagle owners weren’t. The original incarnation of the Eagle continued to publish until 1955; a new Eagle has been revived as a community newspaper in recent years). In 1861, Whitman moved to Washington, DC, to aid in the Civil War effort (he worked as a nurse’s aide in a hospital) and wouldn’t spend as much time as he used to in New York City… but not before penning a series of essays published in the Brooklyn Standard called his Brooklyniana. It was Whitman who proposed Fort Greene Park surrounding the memorial for soldiers who perished on British prison ships anchored in Wallabout Bay, and his only remaining Brooklyn residence stands at #99 Ryerson St.
Just outside the park on a Cadman Plaza East lamppost is affixed one of Brooklyn’s last remaining color-coded vinyl/metal street signs, which first appeared in 1964; the Department of Transportation commenced a phase-out in 1984 and converted to green signs in most areas. In the 1950s, Washington St. between Johnson and Prospect Sts. 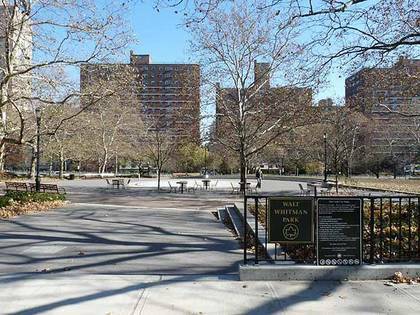 was re-named Cadman Plaza East. 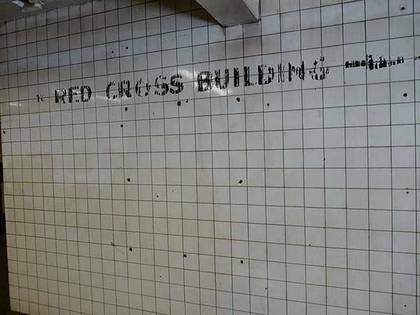 A short piece of High St. between Washington and Adams was re-named Red Cross Place in the 1950s, as the Brooklyn headquarters of the worldwide relief agency was located there. The street, and this painted sign in the station remain, but the HQ does not.